← Yildiz Palace. The last imperial residence. Many tourists visit the most famous monuments in Istanbul and leave with an excellent overview of the architecture and landscapes of the city. However, the most conservative and traditional areas often remain outside the programs. Visitors who want to learn a little about that part of Turkish society, have an excellent opportunity visiting Eyüp Sultan, the first mosque built in Istanbul after the conquest. In fact, Eyüp is the name given by Turks Abu Ayyub al-Ansari, one of the companions of the Prophet who was actively involved in the expansion of the new religion through war. However, the walls of Constantinople proved to be a too powerful obstacle to the young Arab army and Abu Ayyub al-Ansari died while trying to capture the city in the year 670. He was buried near the walls and his tomb remained lost for centuries. When Mehmet the Conqueror was preparing for what proved to be the final assault on Constantinople, the old tomb was found and it was interpreted as a sign of good omen. After the fall of the city, the Sultan ordered that the first mosque to be built in Istanbul would be located at the site of the tomb. Today it is a place of worship and pilgrimage for many Muslims. The surrounding neighborhood is an example of Istanbul conservative areas . To get Eyüp you just have to take one of the many buses from the Spices Bazaar Square, next to the Galata Bridge, and head along the Golden Horn to the north. The ride is about 25 minutes and it is a nice trip in which we will pass close the Orthodox Patriarchate of Constantinople and the St. Stephen Bulgarian Church in addition to see the parks besides the Golden Horns shore and the bridges that cross it. The mosque is surrounded by a lively pedestrian area with shops and restaurants that are crowded from early. Especially on Fridays and weekends, many Muslims attend the first prayer of the day in the mosque and the neighborhood begins a frantic activity that continues with families bringing their children to the tomb of the companion of the Prophet on the occasion of their circumcision. In other monumental mosques across Turkey religious atmosphere is not very touchable, however Eyüp Sultan is the opposite. 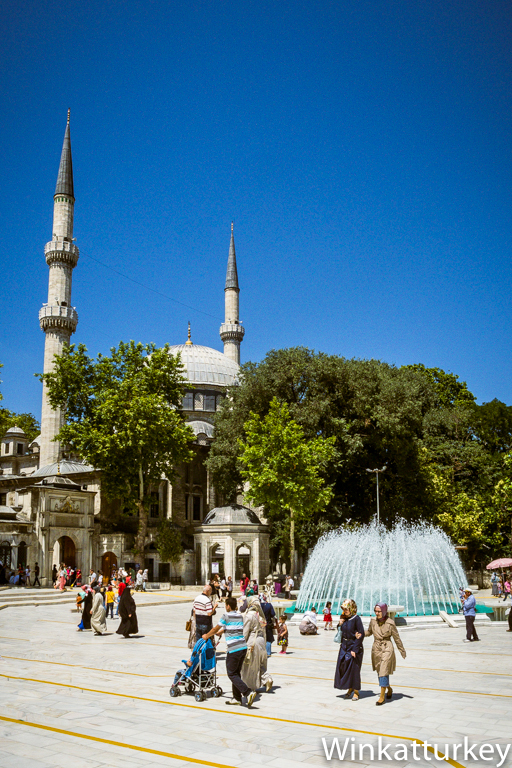 The courtyard, the ablution fountain, the entrance to the mosque, show are a constant movement of people. Here we do find a large majority of veiled women and also many tourists from Gulf countries fully covered. Among people, it attracts our attention the big number of complete families accompanying a child on his circumcision dress to visit the tomb of Abu Ayyub al-Ansari. The tomb is located opposite to the entrance of the mosque and you can see the sarcophagus through a gate. Many people crowd together to pray at the gate and then enter the mosque. Inside we also see many faithful and children praying or just visiting the monumental building. With its stained glass windows and well maintained carpets it is clear that the place enjoys many donations because everything is spotless. To complete our visit, no amount to forget Pierre Loti and enjoy the view of the Golden Horn, the walls of Constantinople and the beginning of the Bosphorus. Nearby restaurant whose owner lives in Zaragoza.